'The Box', the Harvey Smith Ladew estate, a 1780 colonial enlarged by James O'Connor c. 1917 in Old Brookville. 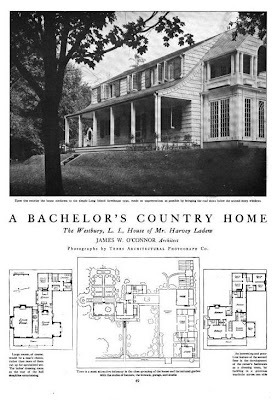 Ladew was an artist and landscape architect. His sister Elise married W.R. Grace Jr. of 'Crossroads' in Old Westbury. Click HERE to see 'The Box' on google earth and HERE on bing. 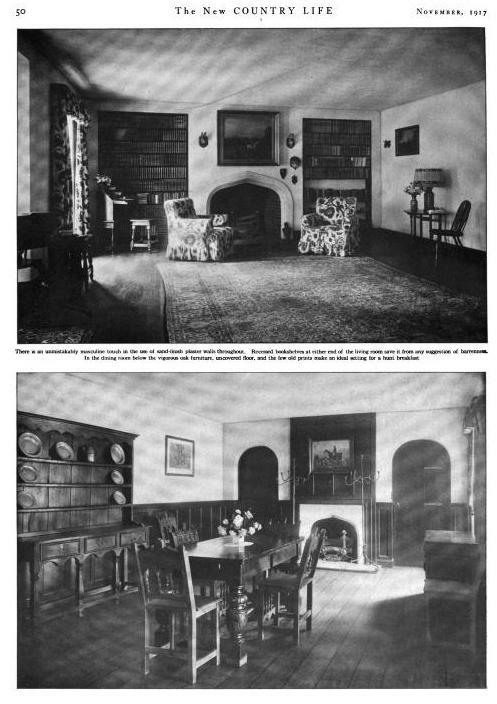 Photos from Country Life, 1917. I have always thought that this house was seriously perfect. What Magnus said. Lots of marvelous details---but what do we expect from the man who created Ladew topiary gardens and commissioned that amazing oval library for his house in Maryland? But, I'm 100 per cent certain that the house in Bing is NOT it. It must have been torn down. It was too attractive to survive. DED...I agree...though it is odd because according to the 1927 map 'The Box' sat almost right in that spot. This must be the sister house to Ladews...this one having survived. If anyone is interested in the house on Bing it was recently for sale. It and the horse farm are now off market. While it is all very attractive, I am surprised at the extent of the interior Tudorish influences (despite the popularity of the day) considering the strength of the Georgian/Colonial exterior. Pretty funny that Trulia lists the house as being built in 1970 instead of 1790. Devoted, Ladew's Maryland house, now open to the public, has much the same feel---some Olde English paneling, etc, with a completely colonial exterior. I also suspect this house is gone. I like ‘The Box’ – it looked comfortable & functional. But I would have tweaked the floor plan – since there were no windows on the fireplace wall in the living room I think they should have extended the entry hall to add a bedroom & full bath on the ground floor (every house should have this) behind the living room; PLUS this would have provided a passage from the kitchen into the entry hall where in the floor plan shown you have to go through the dining room to get from the kitchen to any of the public spaces. On the second floor I’m impressed that each of the four main bedrooms has its own bath (but of course tiny closets). Even the servant bedroom-to-bath ratio isn’t bad at four-to-one. • Looking at the first picture of the front porch & yard – I’m sure whoever had to mow the lawn hated that grass slope & wished the owners had put in a retaining wall. • Surely there were normally more pieces of furniture upon which to sit in the living room. • The smaller paintings in the living & dining rooms are hung way too high – unexpected for an artist. Based on all the dates from other sources listing build date from the 1700's I say remnants of "The Box" survive in the current structure. The odd roof lines suggest something has been cobbled together. Check out the HA link - huge barn or maybe even a indoor court to the east of property, now gone. Open House July 19 4-6pm. Trees for Long Island. Page after page of familiar estates! Can anyone make out the names of the rooms in wing the behind the dining room? Never knew of Mr. Ladew or his topiary garden...his uncle E. Berry Wall, "king of the Dudes" sounds interesting too. • To the left of the dining room fireplace – that small room is a half-bath (& not a really great place to put one). 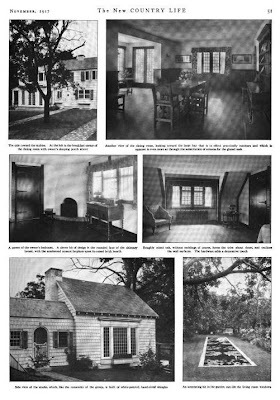 • To the right of the dining room fireplace – butler’s pantry, kitchen, servants’ dining room (in top left-hand corner), half-bath for servants, stairs, laundry (in top right-hand corner), I’m not certain about the two small rooms remaining … one is almost certainly a pantry or store room. Another observation: looking at the Bing view it appears the door used as the front door has moved from the porch that faces Wolver Hollow Road to the door that takes you straight into the dining room … interesting. There must be more to this story... I can't imagine house AND stables would have been moved to the Wolver Hollow location. All maps point to Ladew owning property off Hegemans Lane. In this article it tells of the Nostrand Farm being sold to Ladew. Old maps show this transition. 1930 Blue Book has him at Box Hill Farm. I grew up in this house! I live here at the present time. The home is beautiful and restored.